A brief and quick analysis of today's Jalsa of Dr. Qadri. 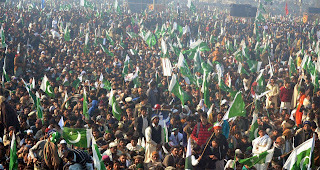 A massive and strongly pro-Pakistan crowd indeed MashAllah with only Pakistan flags. This is great to see. The demand that all clauses of the constitution should be applied in total is the correct one including article 62 and 63. This is a good step and we support it. He did not say it openly but it is clear that he wants a caretaker setup to come into power now. The demand that caretaker period can be extended beyond 3 months is also correct and explain the direction he plans to take. He has promised to block the Martial law. Understandable. He has praised the media. Though we know the filthy reality of media, but his statement is understandable. He has to use the media for now. The call for a March on Islamabad is also understandable and a similar Jalsa in Islamabad would create a serious crisis for the government and the Supreme Court. All political parties and analysts in media have been surprised by the strength of the Jalsa and indeed Dr. Tahir has emerged as a major player now in Pakistani politics. Dr Tahir has NOT exposed all his cards and the next line of action remains in suspense and would unfold in the coming days. He has basically remained focused within the political system, NOT giving any indication that the judicial and economic system of the country would also be changed. He talked of strengthening the judiciary, freedom of media etc but not of changing the systems. There are few serious issues which need to be clarified and addressed. The real test of Dr. Tahir would begin NOW, after the Jalsa. Remember Imran Khan Jalsa in Lahore???? First Jalsa is always a strong bang. It is later when the challenge starts to get out of control, just as PTI is facing today. The presence of MQM in the Jalsa and their unconditional support is dangerous sign. If the demands of Dr. Sahib are met, MQM would be totally out of politics. Then why is MQM offering unconditional support to Dr. Tahir? Just as Shah Mehmood Qureshi and Khursheed Qasuri hijacked the PTI, similarly, MQM would also try to exploit this new enthusiasm of Minhaj youth to hijack the entire movement. MQM is a sinister snake party. Just before the Jalsa, MQM's top Rabita Committee leader sent a tweet message to US state department congratulating the on the successful Jalsa !! Now this is highly suspicious and we would strongly advice Dr. Tahir to learn from the mistakes of Imran and keep MQM away. There is no khair in Altaf Hussian. Why would MQM send a Mubarak baad message to US government ???????? What is MQM and US government up to???? The government is in a crisis now. Many people would contact Dr. Tahir now and would try to offer him lucrative seductions to exploit the strength of this Jalsa today. The real test will begin now. If he can hold his ground against threats, blackmail and seductions, he may be able to bring a caretaker government after Islamabad Jalsa. The field is all open now. The major political parties have shaken indeed. Supreme Court is in a crisis also. Army is surprised and is watching the development closely. The events now can go in any direction. The field is totally open and unpredictable. Government would not give in easily. If the chaos and anarchy becomes too destructive, then army may have to step in sooner than later. We do not think, the regime or the SC would implement anything in the next 3 weeks. May Allah bring khair for Pak Sarzameen. We see major chaos, crisis and turmoil in the coming days now but hopefully, khair will emerge from this chaos.